Easily become accomplished achievers, generalists who do many different things well: multi-talented. Practical, productive, usually prolific, cross-fertilizing areas of interest. How to motivate me. Sevens want to maintain their freedom and happiness, to avoid missing out on worthwhile experiences, to keep themselves excited and occupied, to avoid and discharge pain. People like me: John F. Kennedy, Benjamin Franklin, Leonard Bernstein, Leonardo DiCaprio, Kate Winslet, Elizabeth Taylor, Wolfgang Amadeus Mozart, Steven Spielberg, Federico Fellini, Richard Feynman, Timothy Leary, Robin Williams, Jim Carey, Mike Myers, Cameron Diaz, Bette Midler, Chuck Berry, Elton John, Mick Jagger, Gianni Versace, Liza Minelli, Joan Collins, Malcolm Forbes, Noel Coward, Sarah Ferguson, Larry King, Joan Rivers, Regis Philbin, Howard Stern, John Belushi, and “Auntie Mame” (Mame). My Tendencies: When moving in their Direction of Disintegration (stress), scattered Sevens suddenly become perfectionistic and critical at One. However, when moving in their Direction of Integration (growth), gluttonous, scattered Sevens become more focused and fascinated by life, like healthy Fives. So, take the test, and tell me who you are! The problems at NWBC were there long before I ever came, and in no way did I cause them. My leadership was such that many of the problems that were “under the table” were brought to the surface. There is nothing that I or anyone else could have done to turn the church around without the drastic process of a complete restart. He told me that he had clearly communicated these three points to the leadership team of NWBC as well as the Executive Director of the Midwest Baptist Conference. Therefore, the concerns he had about me were in no way related to the results at NWBC, and that alleviated my fears quite a bit. He told me that he had done 40 interviews, and one theme came up in about 15 of those interviews while another theme came up in just about all of them. Some people had mentioned that I wasn’t willing to do any visitation or personal pastoral care. Along with this, some gave specifics of why they perceived me to be insensitive in some way or another. I had failed to make personal face-to-face contact with them in response to certain events in their lives that I would have known about from prayer requests printed in the bulletin. The consultant and I talked about that for a bit, and he basically told me that making personal face-to-face contact is a necessity for demonstrating to people that you care. I’m cool with that. The second theme was that nearly everyone said something like I was stubborn or unwilling to change my mind. On that point, the consultant told me that he wasn’t really sure where it was coming from, and he didn’t even have any specifics to tell me. We talked about it a bit, and my own conclusion is that I am very firm on certain principles, and that can be perceived as a general stubbornness if there isn’t the personal connection with people to help them feel comfortable enough to really talk with me about challenging issues. Make an extra effort to build relationships through being physically present with people rather than relying on phone calls, emails, letters, or even church programs. Make an effort to draw closer to people who are my antagonists rather than pulling away from them. If I withdraw from them, they will find other (more damaging) outlets for their frustration. Initiate opportunities for me to listen to others so that they begin to see that I really am open to talking about things and even to hear them challenge me on issues. I need to initiate those discussions to establish that the open door really is open to them. I can do those things. What’s Wrong with Me? — Facing my problems again. It has been a few months since I left Northwest Baptist Church, and in the intervening months, NWBC has been going through a process of evaluation with a church consultant. The process of a restart boils down to these things: The district identifies a church planter to be the new pastor; then the congregation affirms him; finally, the congregation hands over all assets (name, constitution, property, bank accounts, etc.) to an advisory team comprised of a district representative, the new pastor, the pastor’s coach, and a few members of the congregation. From that moment on, the previous church is officially dissolved, and the assets are used in the formation of a new church fellowship. This model has had great success in the transformation of dead churches into living and active churches, but there are of course difficulties along the way. Last week, the congregation voted to do a restart, and I’m glad they did. Charlie has gotten me hooked on paper airplanes again. As a kid, I used to make hundreds of them. My friend had a book with what must have been 50 designes, and we memorized them all. I can still remember some of them, but there are others I can’t remember at all. Anyway, as I’ve gotten back into it, I’ve found a couple great sites online, and I thought I’d post the links here for myself and for anyone else who might be interested. Sabertooth Paper Airplane <– You have to try this one! This morning at 9:30, we signed the final paperwork to close on our new house. There still are some things the builder is doing to put the finishing touches on it, but we have started moving things over! Please join us in prayer that God would make our new home a central point for fruitful ministry in Lafayette. 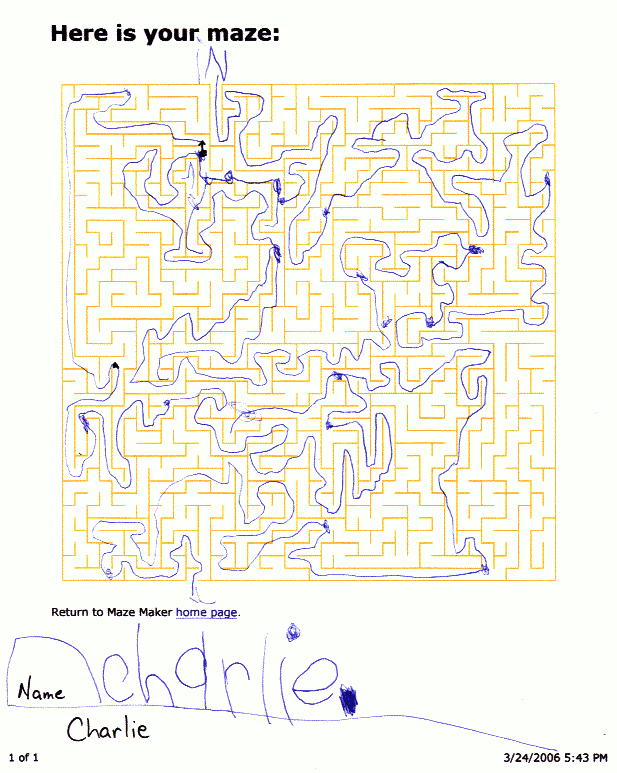 We’ve been making our mazes by using the tool at this website. Is there “Recovery” for the homosexual? In the living room of my in-laws’ home I watched an episode of Law and Order that I haven’t seen before, and it bothered me quite a bit. The victim was a young man who had tried unsuccessfully to “recover” from homosexuality through the counseling and support of a religious group called Regenesis. One of the supporters of the organization was a local doctor who had been promoting research that homosexuality was a reversible condition. They connected the concepts of “Regenesis” and homosexual “recovery” to the attitudes of the vicious anti-gay religious protesters such as the infamous “God Hates Fags” pastor Fred Phelps. In so doing, they were trying to say that whether your methods are “acceptable” or not, a negative perspective of homosexuality in any sense is “unacceptable.” It’s the basic TV belief that tolerance is paramount (of course, the exception to this rule is that we must be intolerant of the intolerant). They directly attacked the efforts (not the research or the results as much) of the homosexual recovery agencies. In fact, they basically said that it was stupid for anyone to think a homosexual could “change.” I think they presented the “Regenesis” group in a good light but then quickly tore them down as being just as unaccepting, bigoted, and irrational as the Fred Phelps types. I’m offended by these things because I feel they are dealing with a religious / moral issue as if it were a rational one. They are downplaying the heart of love many Christians have for homosexuals if it is ever combined with a belief that homosexuality is, as the Bible claims, an unnatural behavior. They are basically saying that people have to be idiots, bigots, or something worse to think that homosexuals can change or even control themselves. I for one, have a higher view of both God and people than that. Yes, I unashamedly believe that people can change. I am a sin-aholic. My body is addicted to so many sins that I can’t even get into it all here. But I am undoubtedly addicted to sin. However, an amazing thing is true for me. My love for God oftens outpaces my desire to sin. There have been times in my life when I have been strongly tempted to sin but have instead resisted and claimed the promise God gives me—resist the devil and he will flee from you! My point is simply this: We are all sinners. Each of us struggles with different sins with different levels of consequences in this present world. So what if the jury is still out on the present-day consequences of homosexual behavior? The jury is still out on the present-day consequences of coveting too! But that’s why God didn’t tell us to decide these things based on a jury. He’s simply told us what he wants, and we need to find our place in his will as we are set free from sin by the power of the cross and bound to righteousness by the indwelling of the Holy Spirit. I’d love to hear your comments on this one. Is there recovery for homosexual people? Do you know anyone? Have you experienced it yourself? Please write some thoughts and help me make this blog entry a helpful one for others too. I continue to be impressed with Charlie’s ability to put these things together. This one is better than some of mine! Charlie has been getting into stop motion animation, and I think this one is one of his best. NOTE: This video was made from pictures taken ENTIRELY by him. I wasn’t even watching him do it. Of course, I did the computer work to put it into a movie, but he took all the pictures himself. When one car causes another to crash, a helpful Jedi Knight arrives to save the day by using the force. How would you defend the authority of Scripture? One of the most foundationally important issues when it comes to any religious or theological belief system is the understanding of where the authority for one’s belief originates. Catholics look to the traditions and history of the church, but Protestants (and more specifically, Evangelicals) recognize the Bible as the sole authority for matters of faith. Here are a few key reasons I personally believe in the complete authority of Scripture over every other human or institution. What is Scripture’s major theme and purpose? The central theme of the Bible is God’s work at creating for himself a unified family of people who worship and love him. He does this despite the repeated efforts of people to run away. In theological terms, the story of the Bible is Creation, Fall, Redemption, and Re-Creation. Jen and I had a good time at Hillside Community Church in Crown Point this past weekend. They were having their missions conference this month, and I was the featured guest this weekend. Since their theme was “His passion, our purpose; his purpose, our passion,” I dealt with the question of what was the number one thing on the heart of Jesus himself. Anyway, the church is pretty healthy and is raising money to support their missions budget for this next year. Last year, they raised over $20,000, and this year they are hoping for $30,000! Thank you for your prayers for us. It looks like we will soon be having a new church partner and perhaps some individual supporters as well!